We are opening a new Volkshilfe Shop with ReVital-partnership and a “SOMA” Social Market in Linz-Urfahr. Join us for the grand opening on April, 17th 2015. The new shop with it’s more than 300 m² has a lot to offer: certified second hand articles like furniture, dinnerware, electric devices, books, toys or sports and leisure ware. The shop is located in the middle of Linz-Urfahr. You can reach the shop comfortably by tram line 1 or 2 or by car – free parking lots are available. 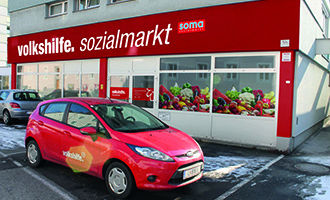 Right next to the Volkshilfe ReVital Shop you can find a “SOMA – Social Market”. In the SOMA you can buy food and sometimes articles of daily use like soap. The prices are very low. The SOMA is a shopping facility for people with little income. Shopping is only possible with an special shopping card. The shopping card is only issued after an income statement and for people with an income by less than 857,73 Euro (single person).